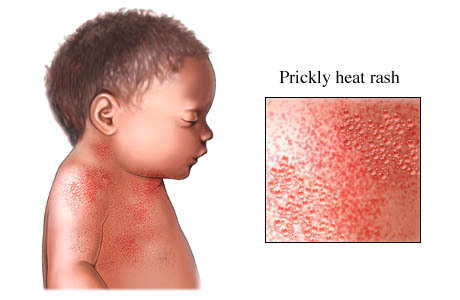 Heat rash is sometimes known as “summer rash” or “prickly heat” and is when your baby develops tiny bumps (and occasionally blisters) that appear red due to overheating. This most commonly affects babies but can affect children of any age. The most likely places to spot heat rash in toddler and baby are the folds in his skin as well as areas where clothing fits tightly such as the buttocks, crotch, stomach, or chest. When noticing heat rash in toddler and baby, you should take prompt measures to relieve and treat the condition! What Causes Heat Rash in Toddler? Humans of all age sweat in order to cool down but when you sweat too much, the pores can clog, preventing sweat from getting out. This in turn causes heat rash and it is more common in children and babies because they have smaller pores compared to adults. Although heat rash is most common during the summer it is also possible in the winter, especially when your baby has too many clothes on or has a fever. Heat rash in toddler and baby can also develop after a cough ointment is applied on the chest. Heat rash appears as tiny pimples or dots and in young children it can be on their shoulders, neck, or head. In some cases the areas with the rash will become irritated by scratching or clothing and lead to a secondary skin infection. Heat Rash in Toddler--Is It Serious? Heat rash is not serious but it does indicate that your child is too warm. If he continues to overheat, he may develop heat exhaustion or heat stroke. Some studies also suggest that overheating during sleep may increase the risk of SIDS. Heat rash is usually diagnosed based on its appearance and rarely requires medical treatment. If your child develops a heat rash, pay close attention to possible signs of an infection which can include a fever higher than 100 Fahrenheit (37.8 Celsius), chills without a known cause, swollen lymph nodes (in the groin, armpit, or neck), pus draining from the area, red streaks from the area, or an increase in warmth, swelling, redness, or pain in the affected area. If you notice any of those symptoms, contact your doctor right away. Heat rash is not usually painful for your baby but in some cases it may be itchy or the bumps might be tender when touched. If you think your baby has heat rash, you should take him to the doctor to make sure it is not something serious that appears similar. Always see your baby’s doctor if the rash stays longer than a few days, gets worse, or is accompanied by a fever. Most of the time heat rash in toddler and baby will disappear within a few days, but you can take some steps to reduce your baby’s discomfort and itching. Warning: You should visit your doctor anytime the rash gets worse or if your baby has a temperature of 100.4 Fahrenheit (38 Celsius) and is less than three months or 102.2 Fahrenheit (39 Celsius) and is three to six months. Take steps to reduce the humidity and heat your child is exposed to by going into a shady spot or airy room. You can also use a mini fan when you are outside and put a fan in your child’s room at night. Try dressing your child in cotton and avoid synthetic fibers as they trap heat. If you can, remove or loosen his clothes and try to keep him out of his diaper as much as possible. Do your best to cool down your baby’s skin with a tepid bath or cold, wet flannels. Instead of using towels, let his skin air dry to help heal his rash. You can also use calamine lotion (avoiding the eyes) and this is especially useful when the baby is irritable or finds touch uncomfortable or painful. Also pay close attention to your baby’s temperature as he could easily get chilled when his temperature drops. In cases where the rash is severe, your doctor may recommend hydrocortisone cream. Avoid using other lotions or ointments as they can trap moisture within the skin, worsening the rash. How Is Heat Rash in Toddler and Baby Prevented? There are several steps you can take to prevent your baby from developing heat rash. Always keep him cool and comfortable by wearing lightweight clothing that is loose-fitting. This is especially important in humid, warm weather. Opt for natural fabrics as they allow your child to sweat with more efficiency than in synthetic fibers. You should also avoid plastic diaper liners and plastic pants. Try to avoid wearing abrasive fabrics (such as wool) when holding your child. Avoid overdressing your child no matter the time of the year. Many parents make this mistake in winter but remember that children will need the same amount of clothes as adults. In some cases lightly dusting cornstarch can help prevent rash from developing in his creases but never use talcum powder (as it is dangerous for babies when breathed in). If it is hot outside, stay inside with your baby or find breezy and shady places to sit outside. Always keep him well-hydrated by frequently breastfeeding. Make sure that the area where your baby sleeps is well-ventilated and cool. Regularly check your child’s skin to see if he is too hot and adjust accordingly. Bathe your child using cool water and a non-drying soap. Don’t use ointments or creams as they block pores and won’t prevent heat rash.